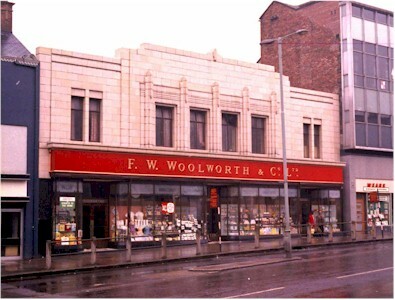 F. W. Woolworth & Co. There are 8 comments for this item. In a water-filled clear plastic bag. I remember in the 60's, the Woolworth store in Middletown NY would give away free goldfish on Washington's birthday....so much fun......! 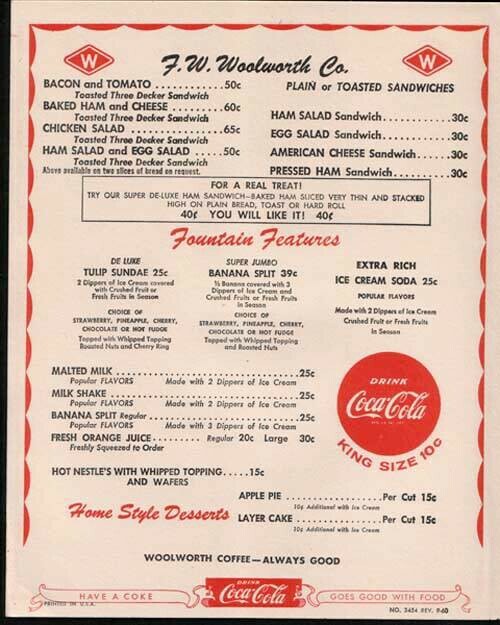 I guess you could say Woolworth's was one instance of a "5 and dime" store, just as McDonalds is one instance of a burger stand. Both offer(ed) more than those labels might lead you to believe. 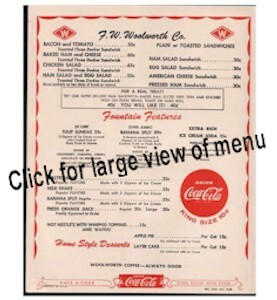 I never understood the difference between Woolworth's and 'the 5 and dime." Were they the same company? My first Sunday School teacher worked at the candy counter at our Woolworth store downtown, before malls. That "king size" Coca Cola on the menu reminds me of the phenomenon of "super sizing" that has occurred over the past decade or two. I was asked at the movies yesterday what size beverage I wanted. The "small" was probably big enough to hold two of Woolworth's king size Cokes; anything bigger and I wouldn't have been able to sit through the movie.